I don’t know whether anyone’s noticed or not, but I took down chapters 4 through 9. You may be wondering why I would go and do that. For one thing, I’m hoping it’ll convince more people to order a physical copy of the book, which you can do here. 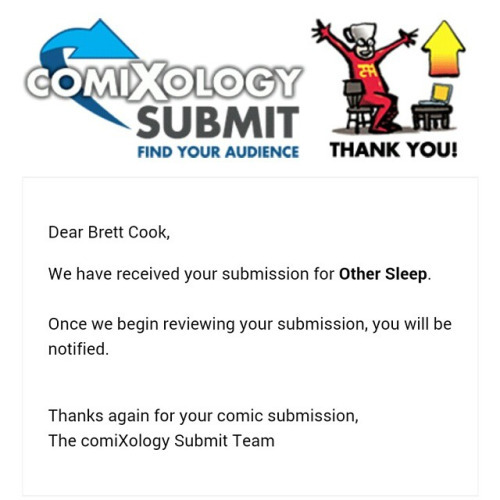 That’s right, I’ve submitted the whole thing to ComiXology in the hopes of getting my work out to a larger audience! I did this two weeks ago. I’ve heard it takes forever to hear back from them. Will they accept it? I have no clue. If so, it’ll be available, DRM-free, for the low price of $4.99. Should they reject it, I have another place to put it, though I know it won’t reach nearly as many people there as it would on ComiXology. So, you know, fingers crossed. And if all else fails, I’ll just put the chapters back up on here! Sounds good, right? Hope so.